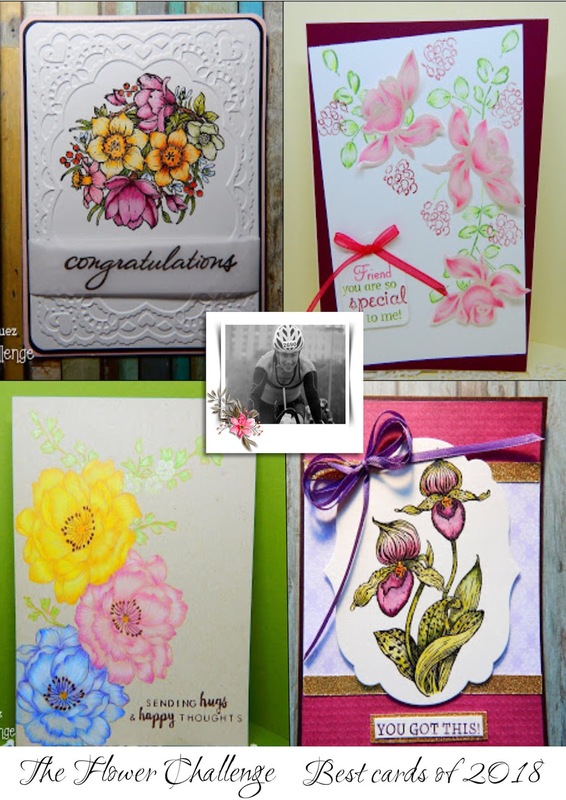 swimbikerunandstamp: HOPE EVERYTHING'S ROSY IN 2019!!!!! HOPE EVERYTHING'S ROSY IN 2019!!!!! Hello, dear blogging friends: Before I continue and share with you the new theme for THE FLOWER CHALLENGE, I want to thank all of you who visited my blog during 2018 to check out my cards and leave me such beautiful, heartfelt comments, it's a thrill to read them and I appreciate each and every word, I hope you continue to visit me from time to time this year. I want to take this opportunity to wish all of you a Healthy, Joyful, Peaceful, Love filled and Prosperous 2019. 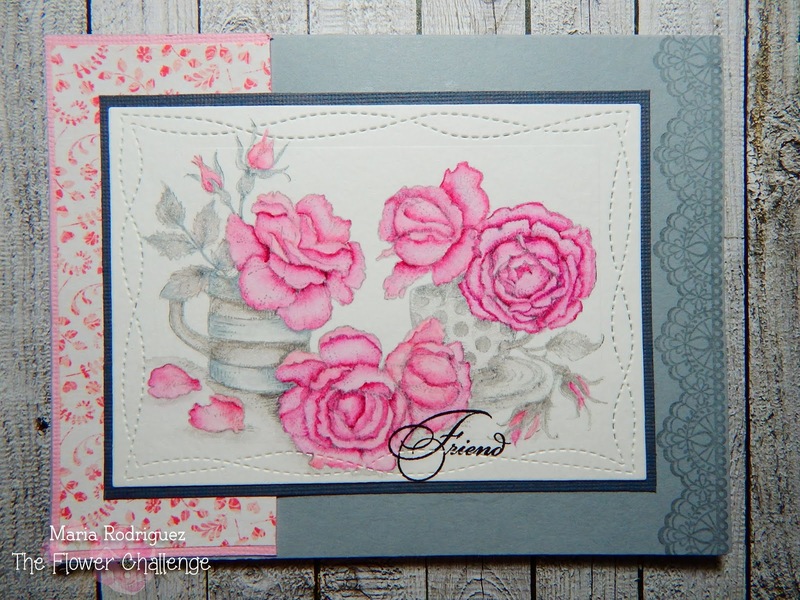 This is a really beautiful color combination, PINK and GRAY and I'm sure you'll have lots of fun creating your cards, we can't wait to see you in our gallery. This is the card I made and I hope it will inspire you to come and play along with us. The image is from a Power Poppy set called Everything's Even Rosier, I stamped it with Stazon Gray ink on water color paper and colored it with SU Markers and Prismecolor pencils. The pattern paper is from Lili of the Valley and the lace border is stamped with SU "Delicate Details" stamp set (retired). 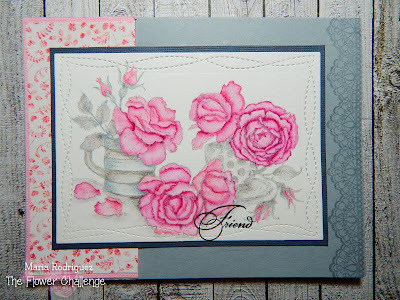 The sentiment is from the set stamped with Picked Raspberries distress ink. At this time, I wanted to share with you a few of my favorite cards I made last year, I picked them because they have different techniques and styles, I hope you enjoy this group. There is dry embossing, heat embossing, no line coloring with Prismacolor pencils, water coloring and heat embossing on Vellum. 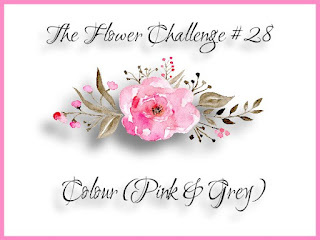 I hope you come and play along with us at THE FLOWER CHALLENGE first challenge of 2019, please remember to display our banner on your blog when you upload your card to the gallery. You can only participate in 6 other challenges, including ours. Thank you for stopping by, I sure appreciate your kind comments. Ohhh, I've really been loving gray a lot lately, and in combination with the pink it's especially lovely. Not to mention your stellar coloring of such a beautiful and favorite Power Poppy image. Wow! What a line up of gorgeous flower favorites, too. I can say how pretty the top left card is in person. You did an amazing job on all of these, Maria. Happy and healthy 2019 to you! So beautiful, Maria! You do amazing things with flowers and ink to make them gorgeous! 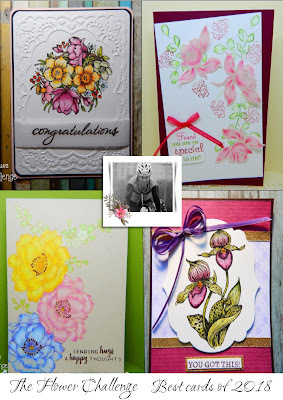 Love the card and the stitched impression around the flowers. Hope your 2019 is amazing! So pretty ! The colors are just beautiful . Looking forward to your beautiful creations this year . It is always fun to come see what you have on display . Happy New Year ,my friend !! Woo! Love this color pallet too! And look at you using up some Designer Paper! Score! Precious, absolutely feminine nicely done my friend, Happy New Year! Beautiful roses! Well done, Maria! I love the softness of the containers that let those gorgeous roses shine, Maria. Gorgeous card Maria and I love your beautiful coloring as well as the background! So pretty and your four cards are gorgeous as well! really beautiful card Maria...I didn't know if I would like this colour combo but as it turns out, I'm really loving all the cards made using it!